Will someone please tell me some interesting things to do with beets? I had a cold beet salad at an Ethiopian restaurant and it was really really good, but I remember beets as mushy, round, canned things that the government provided to my after school program. I know nothing about beets other than I liked the salad and hated the government beets. Help, please. Note: I am not overly fond of borscht either. I liked the crunchiness of the beet salad. I apologize if beets have already been discussed here...they're just so red and weird that I thought they might deserve a new thread. beets are an interesting ingredient. i have become fond of roasting them whole in a bit of oil and then thinly slicing to use in salads or as a side veg. there are also some very pretty varieties grown to search out in markets. color ranges into yellow-orange to blood red. i've been to this place called white fence farm where they serve a pickled beet relish that is the bomb. 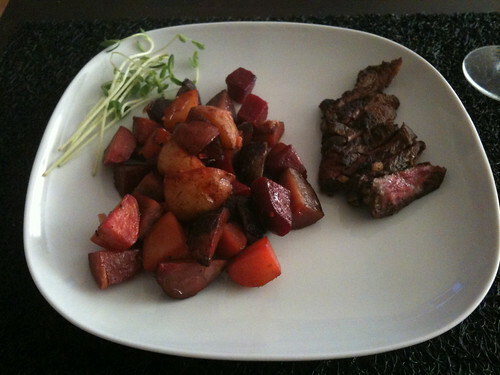 I love beets roasted, like jdchurchill describes. They are so sweet and so incredibly red! There is also the beetiness of them, which you either love or hate. I haven't done much else with them though. I did have a fabulous meal of oven-roasted beets stuffed with a mixture of red cabbage, walnuts, and bread in a goat cheese sauce once. I should try to duplicate it. mix the lot up, stick in the fridge to marinate and cool. to have it more salty and light, use feta. for a more complex taste, use blue. I've even used slivered almonds to sub for walnuts or pecans. it works with canned beets, but those never taste nearly as good as fresh beets. *When you roast them, are the crunchy or mushy? The beet salad I had was crunchy. *When you roast them, do you peel them first? I read what The JoC had to say and it said that the skin would come right off, but that seems unlikely. They stay more solid and crunchy than get mushy. They definitely do not mush like a potato. I just scrub the skins, cut off the root and the top, but don't peel. Ok, that's good news! The government beets I had as a child were mooooooshy and gross. I am going to the Ethiopian restaurant this weekend, so I'll get the beets again and see what else is in there. I'll report back! i just scrub the skin. but you could peel it too, no worries. peeling probably will get more red on ya. I juice them with spinach and carrots for a refreshing drinky. I cut beets up in chunks, toss with some oil and roast in the oven. Afterwards I sprinkle feta and fresh parsley on top. Really easy. the natural beetiness is so good, i cant imagine them needing much to make them very tasty. xpost - what does that do to the color of your teeth? Beetroot juice is like drinking liquid mud, disgusting and stains everything to buggery. But I do like thin little strips in salad, or little beety crisps. Pickled beetroot is, indeed, the bomb. hamburgers and sandwiches are where beets belong. so good. Roasted beets tossed with a quality evoo, a chiffonade of fresh mint and a drizzle of balsamic is a real treat. I always try and roast beets a little bit under so that they have some texture and toothiness to them. I picked up two bunches of young beets at the farmers market on Saturday - beet greens are soooo good! Better than chard, no bitterness at all - just chop them up, stems and all and saute for a few minutes. I'm roasting the roots tomorrow, for dinner with leftovers for salads during the week. I am going to try the beet again. The last time I had them at the restaurant they were mushy and not nearly as good as I had hoped. Can you grill beets? Rather, can I grill beets? It's something to try - I think brushed with oil and skewered, they would have to cook about as long as a carrot. I have one of those madeline slice-yer-finger-off slicers, it does amazingly thin slices of root veg, I must try some deep fried beetroot crisps (and some sweet potato ones). I have roasted beets for 90 minutes and found them to still be way too firm to actually eat pleasantly. Not that I am fond of mushy beets. Just get some medium sized beets and go to town! I got some in my produce box yesterday. Rah rah rah. I'm still merely contemplating beets. I made Ethiopian food this weekend (mesir wat and mixed veg with berbere and garlic -- somewhat inauthentic but tasty) and I was thinking about trying the beet salad but I chickened out. Why am I still intimidated by beets? I am pleased to report, however, that the lentils turned out beautifully and were delish. Also, I revived this for Sarah, since she asked about beets on the Chicago thread. A simple Beetroot and orange salad is always good. 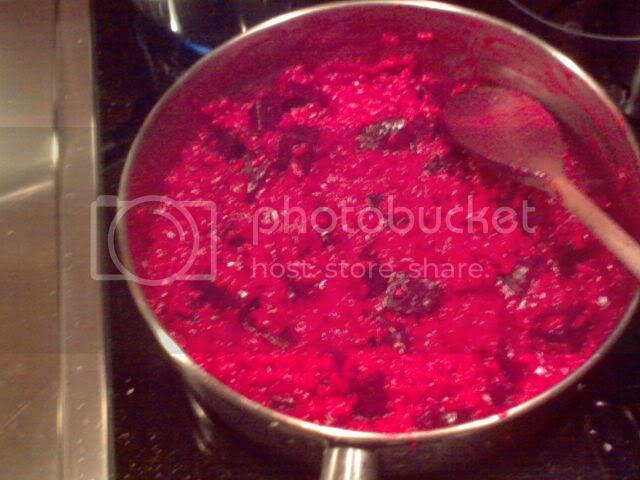 Cooked beetroot with diced orange, maybe a little onion as well. Sour cream and dill if you like too. my new favorite thing is the unhealthy russian beet salad - grated beets, chopped walnuts, a little vinegar, and equal (large) parts of sour cream and yogurt (you want dark pink, not purple). maybe a bit of salt and pepper. Yeah, I know I'm not here often but -- beets! With onions, pecorino cheese, tossed with oil and red wine vinegar, etc. I roasted a giant beet last night. It smelled so lovely and full of vitamins! Today I will eat it in a salad with greens and feta. I need to try one of these things. You do! It only took me...let's see...TWO YEARS to finally roast one. They are a vegetable marvel. They kind of remind me of edible geodes -- all rocky, craggy and scary on the outside; lovely and shiny and marvelous on the inside. i got a vac-pac of pickled beets on sunday and have had 3 beet salads so far. i think tonight's is going to be with stilton. They were crunchy! I'm pleased. Thanks, ILCooking. I am roasting beets RIGHT NOW! So beautiful, so delicious. i have had beets 3 times this week! yay! I am about to roast some beets. I roasted beets (for the first time) (in foil) a few days ago! They were awes. Does anyone know if shredded beets do ok when frozen? If so, about how long do they do ok this way? I have been eating a lot of beets this summer and want to do so once the bounty ends, which is pretty soon I reckon. Everything I'm finding online recommends blanching them before freezing (they keep longer that way, 10-12 months @ 0 deg F). So you could shred, blanch for 3-5 minutes in boiling water, drain, pack into containers and freeze. Ok, that's not too hard to do. Thanks! Bumpin my beets thread to say that I bought some GORGEOUS golden beets. They look like a beautiful rainbow and I can't wait to eat them. Mmm... 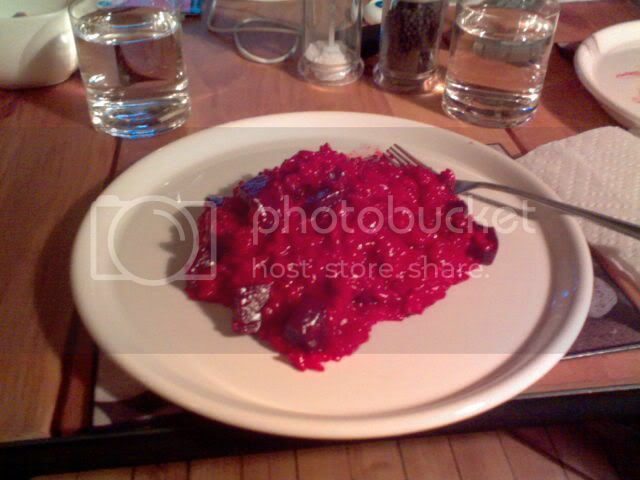 I need to make another beet risotto. I made one several months ago with orange and dill, and it was really lovely. Plus, it looks like a grisly crime scene in a bowl. Both were really good, but I kind of keep expecting them to taste like a mango but then they don't. i've come so far with beets in the last 5 years! and it was delicious. just a bunch of stuff from the fridge, but it sat well together. but it has chicken on it! sorry! i could easily not put chicken on it for your sake. it would taste just as good, it just wouldn't have chicken on it. I am going to slice the roasted beets and toss them with some navel orange and a vinaigrette made with I dunno maybe shallots and sherry vinegar? And some roasted walnuts? Maybe I should pick up some goat cheese. Ohhh and I have tarragon in the garden! yes, good start! you might want to put that mixture on something green to cut its intensity -- any greens will do. not necessary, but this is my preference. canned beets are gross and they are also the reason why i thought beets were gross until i tried them again at the beginning of this thread! I have some arugula, I will put the beets on that! here's a tip -- toast the walnuts in a pan with some butter, brown sugar, salt, and cayenne pepper -- just enough to make a little crust. it will taste v good with the sweetness of the beets. Oh that sounds great and I have all of those things at hand! i got some huge beets today. i have had beet brownies and can confirm they are great. do u guys eat them hot? all the talk itt seems to be salad-related? I love them just out of the oven - I always make extras so we have plenty for salads later, but they are so good warm. roasting is great but most of the time i just grate them & do something with that - fold it into rice or risotto or something. they work better as a taste (& colour!) than as a skewerable constituent part of a meal, for me. whoa damn that was delicious! dehydrating them currently. not sure how I feel about this. Sounds like a lot of work. They keep pretty well in root cellar type storage. Checked the dehydrator this morning and they felt almost done. We're experimenting with making our own soup mixes. Hope it works well - did you cut them into cubes? recent beet revelation: they are awesome in sandwiches! was skeptical when i first noticed this on a menu i was perusing, but then i put some cooked beets, sliced thinly, on a sandwich with stuff - avo, greens, goat gouda, mayo/mustard - and all these things are friends so the combination is really **cking sublime. 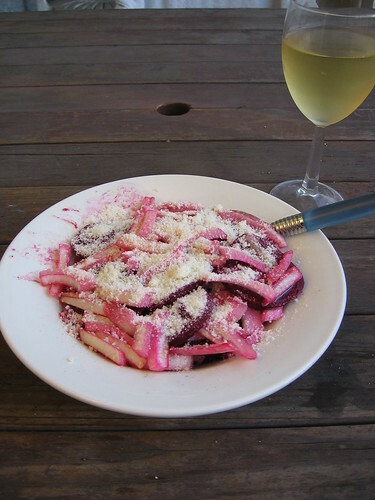 raw grated beets exude a fair bit of moisture so (on a sando.) the juices end up making it a little soggy, if you're not gonna eat it right away ime. I’m attesting to their excellence in sandwiches, not scolding you for cooking them! 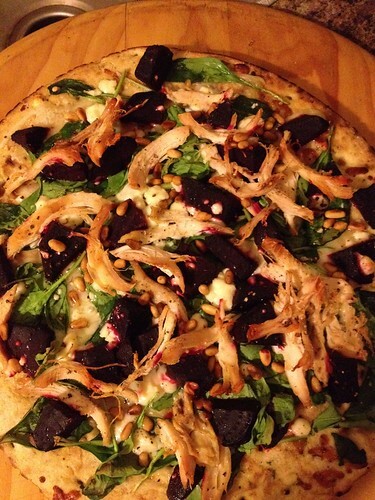 I would eat cooked beets + goat cheese + greens on anything. It's too bad that the cheapest beets are basically splatoon grenades, though. haha i started this thread!! lately i have been making the ethiopian beet salad very simply -- matchstick sliced raw beets (regular, golden, or mix of both) + raw green beans cut into 1" pieces + either queso fresco/farmer's cheese/a fancy feta (sheep milk for example) with some quality olive oil and salt/pepper. the rest of the dishes i usually make to eat with it are so heavily spiced that it's a nice counterpoint imo. Underrated giveaway you're Australian in the brackets there. Have never seen this in the USA but it's standard in French supermarkets, and fabulous. Would you rather have to boil them first to prepare them? Obviously we can buy raw beets as well. raw grated beets + grated apples + grated cabbage = THE BEST COLESLAW. with a bonus of red fingertips for the next 24+ hours. oh, will try that tout de suite! Euler: tins, the alternate container I cited, hold the juice safely inside for as much of the contents as you don’t use at first. Flappy plastic with scissor-cuts in will spill it throughout the fridge, if it didn’t get all over the counter already. oh I see, it's a problem with plastic over metal, ok, I can see that. we just use the whole thing every time but we're a family of five.